WHOOO!!! Finally, after four months – four months! – I have seen the sequel to The Avengers, readers! And it was worth the wait, I have to say! For a while there, I thought those months of waiting were going to make me hate the movie. Not to mention that there were people on the Internet who had made some very derogatory comments about the film. Those bounced around in my head a fair bit. The day prior to seeing the movie, all I could think was: I have been waiting for four months to see this. What if I don’t like it? Well, I liked it so much, that I seriously considered seeing it in theaters again! 😀 However, since the DVD came out October 2, I think I can wait to see the movie on the small screen now. Others have done descriptions of the story’s plot. You can find one grand review of the film by masterleiaofasgard here: https://superherofactsandtrivia.wordpress.com/2015/05/26/avengers-age-of-ultron-review/, which I previously reblogged on Thoughts on the Edge of Forever…and which conveniently gave me the above photograph. 🙂 But I am not going to review the film’s plot here. This is not how I operate with regard to Marvel’s films. Most of my posts about Marvel – its films or other story merchandise – revolve around its characters. I am not sure I could write about a story’s plot as well as others have. This post does not concern a particular character in the film. Those will come later. This article is made up entirely of observations I made while I watched the movie. I will get to the character-centered posts another day. Something I enjoyed throughout the movie was the camaraderie among the Avengers. With all the action sequences, it was a little subdued, but it was still there. The tight friendship between Natasha and Clint is to be expected; and since Thor and Cap have a similar sense of honor and justice, it makes sense that they would get along well and develop joint battle tactics where they use their trademark weapons together in battle. Bruce and Tony’s friendship was well established in The Avengers, and if anything, it is shown to have strengthened since that film. But who could see the rest of the team gleefully helping to razz Cap about chiding Tony for his bad language? Who could anticipate that Tony would join Natasha in ribbing Clint? Truthfully, the respect that Hawkeye and Tony show each other in the movie surprised me greatly. And it is possible that this close friendship is the reason Tony takes such high offense at being kept in the dark about Clint’s family. Does he not trust Tony? I did not see the Natasha/Bruce romance coming. In fact, I openly stated that I did not think it would happen. I certainly did not see Cap giving their mutual attraction his seal of approval. And watching Thor offer to leave a battle midway through to get Hawkeye back to the Aveng-jet and set him up for medical treatment was noteworthy as well. Although it was for a good cause, that Thor should be so willing to leave a battle for the sake of the “weakest” Avenger spoke volumes. But the most unexpected piece of characterization I saw in the film was Tony’s reaction to his Scarlet Witch-induced vision. Oh, I knew that it provoked him to build Ultron without thinking through the consequences. I knew he liked his team. But I did not realize how much he had gelled with them, how much Tony hated the idea of failing his friends – for they have all become great friends through their battles together – and, worse, that he was afraid of not dying with them if and when he failed them. That was an eye-opener right there. And it really should not have been. In the original comics, Tony was very attached to his teammates. He appreciated them all, and he did not enjoy leaving the Avengers when he needed to go on R&R. Tony, like any other warrior, was always aware of when he was too tired to fight and needed rest. But being aware of it did not mean he had to like it. Nick Fury basically admitted that his worst fear is the same as Tony’s. But he also said that he has been through it in the past. So he knows how the fear Tony has was played on by Wanda Maximoff. And Tony fell head-first into that fear. He did not realize that was what he was doing. I think he may still have yet to realize it. Tony was so scared that he did not stop to think through what he was creating. He just wanted to keep his friends safe – or he thought he did. He did not realize he was trying to fix a problem which may never come to pass. So when the A.I. he built to keep his friends alive turned on him and tried to kill them all, they met in the lab afterward and he started to laugh. But it is not a “this is funny” laugh. It is a hysterical laugh, a laugh filled with pain and horror as he realizes that, in trying to save his friends, he has perhaps sealed their doom instead. Naturally, before seeing this movie, I heard a lot of things about it. One of the things I heard was that, at the end of the film, everyone on the team was parting ways. There was bad feeling among them; some of them were just too tired to go on being Avengers. I heard that this Avengers film was not as much fun as The Avengers. I agree that Age of Ultron is not like The Avengers. It has more depth, more to tell. The Avengers was the introduction to the story; Age of Ultron shows where that introduction is heading. Plus, this movie was a wee bit heavy on the action. Since about an hour of the film was cut, these action sequences did not have as many quiet scenes to balance them as they could have. If Marvel had not had Age of Ultron cut down from a three and a half hour film to a two and a half hour movie, the missing scenes may have given it more grace. As it stands, however, I enjoyed the movie I saw in theaters. And I must say that I found nothing unhappy about the end of Age of Ultron, aside from Quicksilver’s death. The changing of the roster of the Avengers did not strike me as painful and fractious. The ending was not sad or scary. It was quiet and hopeful as it saw great friends saying, “See you next time,” and heading off on vacation. Thor, Hawkeye, and Iron Man have not resigned from the team, as many have assumed they have. Resigning means they quit. Thor has not quit the team. He has gone home to Asgard to do some research – and see if he and the others really have been used as pawns in someone else’s game. That is taking a leave of absence, not retiring or resigning from active service, and the son of Odin will be back on Midgard as soon as he possibly can be. Hawkeye is going home for awhile, long enough to be a dad and husband for more than three days. 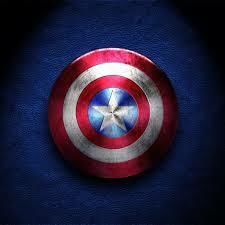 But the minute Cap needs help, he will be back in his suit and have his bow and quiver ready. The fragments from the Civil War trailer prove it. Again, this is not resigning or retiring, and no matter what he told Laura, he has a job to do. As he told Wanda, being an Avenger is his “job.” He has not quit the team, as many have presupposed. He has simply “taken leave” of his duties for the time being to get some well-earned R&R. Soldiers here in the U.S. do that all the time. Tony is going back to his civilian work. In his case, it is also a leave of absence. We know he will be back in his suit in Captain America: Civil War. He will be on the wrong side of the argument, yes, but he has not hung up the Iron Man armor for good. Tony needs a rest (it seems) and ostensibly he is going back to his civilian work to get it. Hulk/Bruce Banner has gone off to make some sense of his life again. He still loves Natasha, but he cannot have a real life with her. He will never be able to lead a normal or close-to-normal life. It is impossible. He is mentally/physically sharing space with the Hulk, and that does not leave a lot of room for anyone else to squeeze into his life, no matter how much he loves them or they love him. This is why he left Betty Ross. And this is why he left Natasha Romanoff. Not to mention the fact that Natasha kind of used him to help save the world. It was for a good cause, but it was still using. Meanwhile, Cap has found where he belongs in the world. He went into the ice a hero, and he came out a legend. What the world needs now is him as that legend. The world needs to be kept together, for the sake of everyone on it. And that is what he is going to focus on doing, at least until the politicians and HYDRA mess everything up in Civil War. Natasha is chained to her current life by her dark past. But she will not stop searching for Bruce – and that might be what saves her, in the end. Until then, she is going to keep busy and help Cap train their new Avengers. So I think the ending for the film was a good ending. I did not see anything painful or dispiriting about it except for Pietro Maximoff’s death, and even that was honored. By and large, the movie left me feeling hopeful, just like its predecessor. That was, really and truly, all that I wanted out of this film. That is all I want out of the other films in the Avengers’ saga. Another noteworthy observation includes the fact that Natasha got to call Tony “Shell Head” in the final battle in Nova Grad. “Shell Head” is Iron Man’s nickname in the Avengers Assemble cartoon; it might also be a nickname for him in the comics, but I do not know that for sure. And watching her ride the Hulk up to a flying city was fun! Maria Hill and Fury both got less screen time in this film, which is always a plus, and Fury only had to give Tony a pep talk this time around. It is too bad he did not physically slap Tony upside the head, but the rest of the team only needed Fury to give them all the dirt he had on Ultron’s plans. That is a nice change all the way around; Fury started out as the team coach, now he gets to play information broker. That is a more “mainstream” idea, and if the movies adhere to the “mainstream” comics in that respect, then I will not complain overmuch! We also get to see more of Hawkeye’s arsenal in the film. His arrows have more than simple bombs or acid/incendiary chemicals in them. He carries arrows that deliver electric shocks as well, not to mention arrows that emit high-frequency ultrasonic blasts. This is probably the type of arrow he used to bring down the last of Klaue’s mercenaries in the cargo ship hold, before stunning Wanda to avoid being a “zombie” again. It is interesting to note that Tony hacked the NSA once on a dare, too. I would have thought he would do something like that on a regular basis just for the heck of it, but apparently he needs someone or something to prompt him to break into government systems. The fact that Bruce was worried about building Vision when Tony proposed the idea was a nice touch, as well. It redeems him at least a little for his part in glibly helping Tony to build Ultron. Watching War Machine and Iron Man work together in the sky was very cool. We have not seen them working together like that at all. Even in Iron Man 2 and 3, all their teamwork was on the ground. Seeing them fly side by side was fan-tastic! It would have been even more amazing if SHIELD had called in Falcon as well, but at least we get to see him joining the team at the end of the movie. 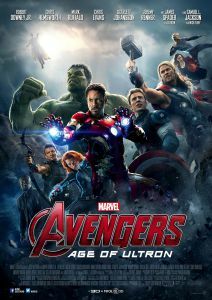 This entry was posted in Marvel Comics' Characters and Stories, Movie Reviews and tagged Aaron Taylor-Johnson, Avengers Assemble, Avengers: Age of Ultron, Black Widow/Natasha Romanoff, Captain America/Steve Rogers, Chris Evans, Chris Hemsworth, Elizabeth Olsen, Falcon/Sam Wilson, Hawkeye's family, Hawkeye/Clint Barton, Hulk/Bruce Banner, HYDRA, Iron Man 2, Iron Man 3, Iron Man/Tony Stark, Jeremy Renner, Joss Whedon, Mark Ruffalo, Marvel Cinematic Universe, Marvel Comics' Characters and Stories, Nick Fury, NSA, Quicksilver/Pietro Maximoff, Robert Downey Jr., Samuel L. Jackson, Scarlet Witch/Wanda Maximoff, Scarlett Johansson, Stan Lee, The Avengers, The Scarlet Witch, Thor Odinson, ultron, Ulysses Klaue, Vision, War Machine/ James "Rhodey" Rhodes, zombie on October 3, 2015 by The Mithril Guardian.